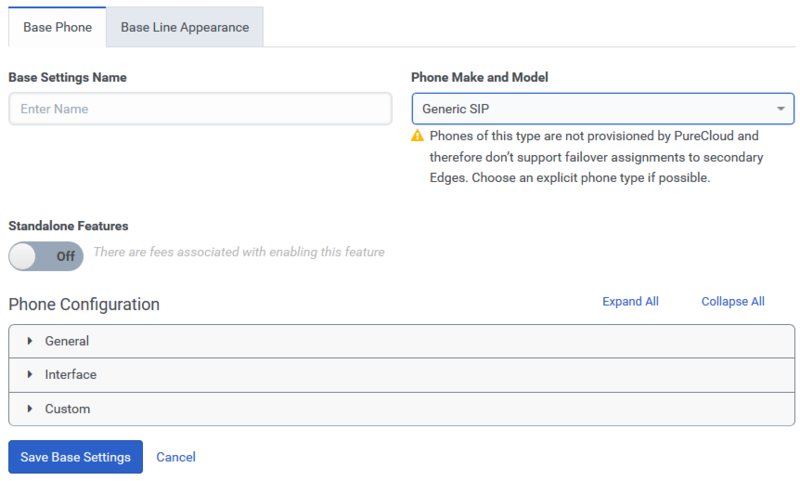 Any SIP-compliant phone can register with PureCloud as an unmanaged phone using the generic SIP phone base settings profile. This profile contains a group of generic settings found on the Base Phone and Base Line Appearance tabs that define how a SIP-compliant phone is to operate in PureCloud. Once you create a base settings configuration, you can save it with the default settings or you can customize the settings. From the Phone Make and Model list, select Generic SIP. Configure the phone to be able to access a secondary Edge. The default setting is Disabled. When you enable this setting, you may have to manually configure the SIP phone to point the primary proxy to the primary Edge and secondary proxy to the secondary Edge. See your SIP phone documentation for information on how to configure proxy settings. Use this setting to configure how the Message Waiting Indicator (MWI), the light that blinks to indicate that the user has a new voicemail. To use the default base line appearance settings, click Save Base Settings. In the Configuration panel, click the arrow to expand the section containing the settings you want to customize. When you enable the persistent connection feature and set a timeout value, you improve PureCloud’s ability to process subsequent calls. More specifically, calls that come in while the connection is still active are immediately alerted via the UI or are auto answered if Auto Answer feature is configured for the user. 自動会議の暗証番号 Required number to join a conference. To use the custom base line appearance settings, click Save Base Settings. Once you have created base settings for a generic SIP phone, you can Create a generic SIP phone.